I love to bake cakes especially when its butter free. And this is one such bakes where in there's no butter and eggs involved. 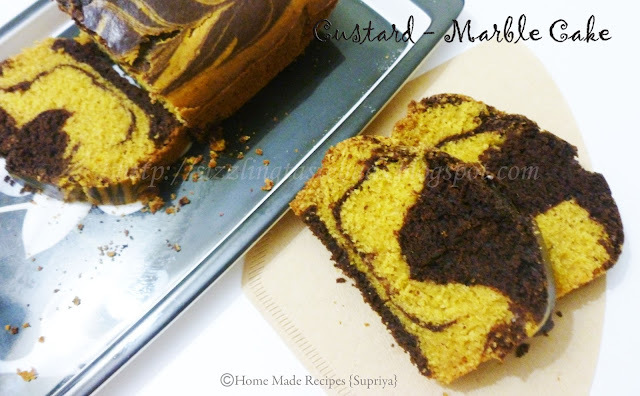 Above that its MARBLE CAKE and the main ingredients here is WHEAT FLOUR and CUSTARD POWDER. I never tried anything with custard powder before except my favorite Fruit Salad. 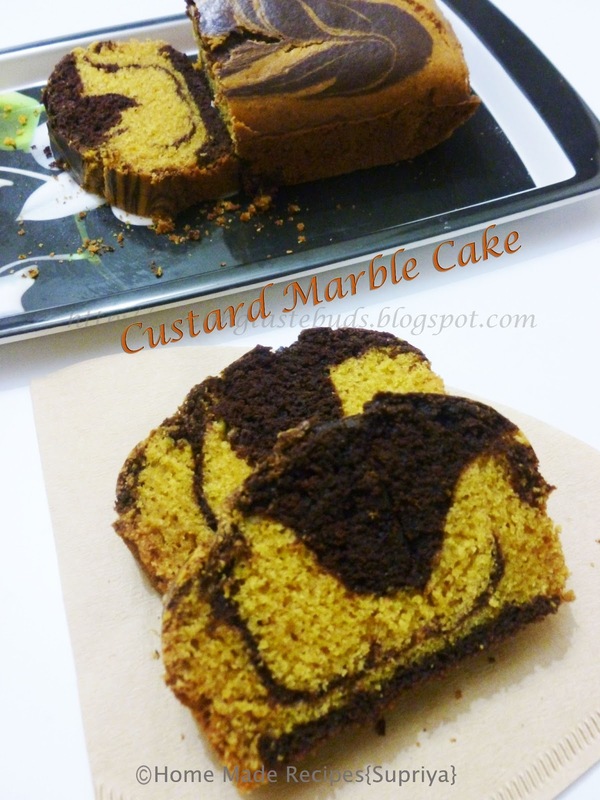 This cake is delicious, with a unique taste of custard and chocolate together. We loved the marble effect on the cake. The whole cake disappeared within an hour. I am sure to bake it again soon. 1. Sift Wheat flour, maida, baking soda and Custard powder. Keep aside. 2. Mix milk, oil, sugar and vanilla essence in a mixing bowl till sugar dissolves. 3. Add the dry ingredients to this little by little to form a smooth cake batter. 4. Now take 1/4 th of this batter in another mixing bowl and add cocoa powder. Mix well to form a smooth thick batter with no lumps. 5. Grease the baking tin or line it with butter paper. 7. Bake this in a preheated oven for about 40- 50 mins at 180C. Check in between with a toothpick coming out clean with inserted in the centre. 8. Once done, take the cake out and leave it in the cake pan for about 10 mins. Remove it from the baking tin later and allow it to cool completely by placing it on a wire rack. Slice this Delicious Custard Marble cake and serve. Best tea time snack. hi.. my crust came too crunchy when i tried this.. is that the way it should come? thanks for trying Uma....try reducing the time of baking. Glad you liked it dear.